Spiceypai is a great place to stay if you enjoy the outdoors! After being cooped up in cities it’s so nice to stay in the big huts right next to a farm. Easy to rent bikes, great area to chill with a nice view, not too far of a walk from town and the staff were always helpful. (Adorable baby and husky there as well). Ended up extending my stay there, would definitely recommend! 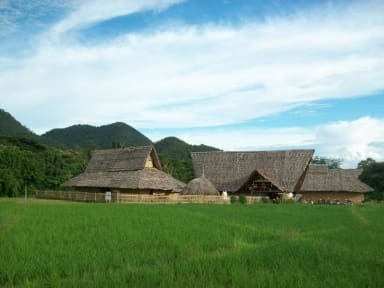 Unique hostel with a nice location overlooking a rice field. You sleep in bamboo huts which is pretty cool. Staff was all very friendly and even took us on a free motorbike tour around Pai. Great hostel for meeting people. Location is outside of town but easily accessible with bike and walking isn’t too far. Beautiful surroundings and very quiet in general (except bonfire and bbq-nights). Lovely staff! Sweet stay with great atmosphere. Occasional bonfires and scooter tours from the hostel workers. Made some awesome friends here too. It’s a nice enough hostel, however, bedding could be cleaner. Mosquito nets had holes in, and although it was unneeded, it should be holeless. Breakfast is pitiful. Non existent atmosphere, no security at all apart from tiny lockers, many of which are broken, freezing cold at night, ant infested showers. 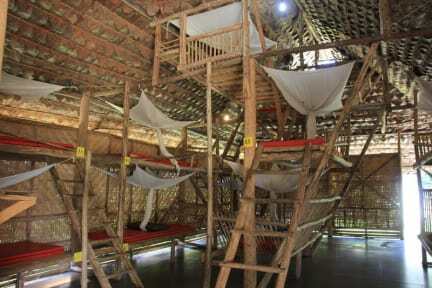 Although it looks cool, this hostel lacks in practicality, so don't stay here unless you're happy living very simply. First time I have ever paid for two nights at a hostel and left immediately after my first night. Seemed like I was bothering the staff at the front desk when I first arrived. You have to make your own bed in a bamboo hut dorm room where you are expected to take your shoes off despite the concrete floor being filthy. You freeze at night! To top it off you're woken up early by guests & staff chatting in the common area about their acid trips which is maybe 10-15 meters from the dorm rooms.